Stephen W. Brown is the Emeritus Edward M. Carson Chair and Professor of Marketing at Arizona State University. He also served for over 25 years as the Founder and Director of ASU’s globally renowned Center for Services Leadership. He is the co-author or co-editor of 22 books and over 150 articles. Engaged with businesses throughout his career, Stephen is a Strategic Partner with The Insight Group, a global consulting organization, and he has worked with corporations including IBM, Johnson & Johnson, Merck, Salesforce.com and many small companies. He’s also been involved in launching eight start-ups. He’s served in leadership roles with many non-profit boards, including being President of the 50,000 member American Marketing Association. Stephen and his spouse feel blessed to have the best of two worlds, having their primary residence in the Phoenix area and living in Flagstaff, Arizona during much of the summer. W. David Connell is a retired Chief Fiduciary Officer for the West Region of The Northern Trust Company. He is a past member of the Board of Directors of the Arizona Community Foundation and the Heard Museum in Phoenix, Arizona. He is a past director of The Phoenix Symphony. He also previously served as Chairman of the Board of Trustees of the Museum of Northern Arizona in Flagstaff and as President of the Museum of Northern Arizona Endowment Foundation. David is a graduate of the University of Nebraska in Lincoln, Nebraska. John has been a Deputy Prosecuting Attorney in his native Honolulu and a Macadamia nut farmer on the island of Hawaii. He retired to his wife’s native state of Arizona some years ago; they shared an intense interest in physics and astronomy – acquired from non-technical readings – and the relevance of science to the humanities and to what it means to be human. He is a long time supporter of Lowell, and has been a member of the Advisory Board for many years. David is the Managing Member of CS Group, LLC, a private investment company. Formerly he was the Managing Member of Vestor Partners, LP, a private equity fund. He is a Trustee of Thornburg Investment Trust, which oversees the Thornburg Mutual Funds. Prior to entering the private equity business, Mr. Chase was a professor of finance at Northern Arizona University. For many years, the family operated cattle ranches in central and northern Arizona. Currently he serves various community and charitable organizations including the Santa Fe Conservation Trust, the Museum of Northern Arizona, Lowell Observatory, and the BF Foundation. He holds degrees from Principia College, The Amos Tuck School at Dartmouth College, and Arizona State University. He and his wife Katherin live in Santa Fe, NM. Donna Weistrop is Professor Emerita of Physics at the University of Nevada, Las Vegas. She is a member of the Advisory Council of Northern Arizona University’s Martin-Springer Institute and of the Executive Committee of the Lowell Observatory Advisory Board. Donna holds a PhD in astronomy from the California Institute of Technology. She has taught astronomy at the introductory, intermediate, and graduate levels, as well as supervised master’s and Ph.D. students. She has chaired and been a member of several NSF and NASA review panels and was on a team that built an instrument for the Hubble Space Telescope. She is an Adjunct Faculty member at Northern Arizona University, a Research Associate at the Museum of Northern Arizona, and a former Adjunct Astronomer at Lowell Observatory. 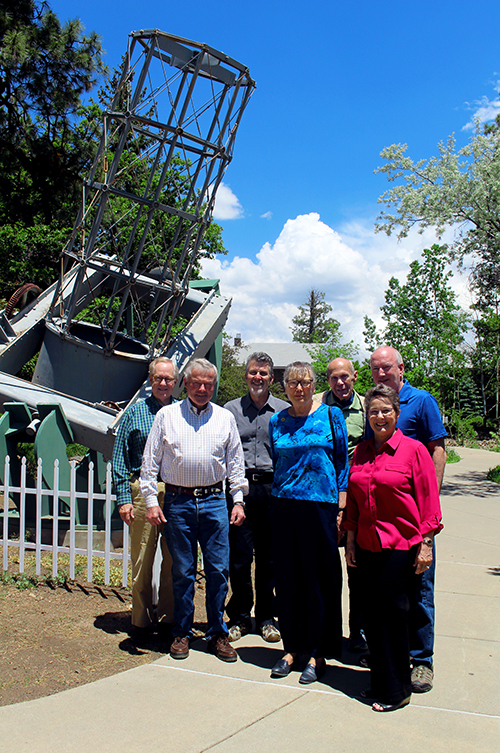 W. Lowell Putnam IV is the great-grandnephew of Percival Lowell, Lowell Observatory’s founder. Putnam was actively involved in the development of early-generation television traffic systems and held senior software development and business analyst positions, including Director of Systems Development for Springfield Television Corporation. He has served on various media industry boards and committees. In 1984 he founded VCI Solutions, a company that provided sales, traffic, and automation software solutions for the broadcast and cable industry. He sold the company in 2010.